Across the board, businesses keep shifting their gears to strengthen their rapport with customers, in an endeavor to boost their retention and sales conversion numbers. With that, a horde of technology giants have stepped up to cater to the Customer Relationship Management (CRM) needs of marketing managers. For long, the high cost and complexity of these purpose-built CRM tools has kept the small and mid-sized businesses at bay, with larger enterprises and conglomerates reaping the benefits endlessly. Recent advancements have brought the reach of CRM tools to the doorstep of businesses—startups and enterprises alike. CRM tools have largely reduced a number of meticulous tasks surrounding the sales and marketing needs. These sophisticated tools include value-added features, such as social media integration, predictive analytics capabilities, vertical specific functionalities, contact management, reports, interactive dashboards, chat integration, and approval management. Collectively, these CRM applications are escorting businesses into the realms of marketing automation. 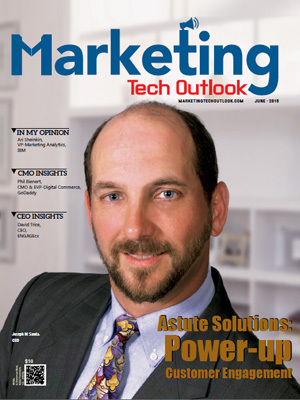 In an effort to help marketing managers foster a more prolific customer base, a panel of prominent CEOs, CIOs, CMOs, VCs, analysts, along with the Marketing Tech Outlook’ editorial board has assessed scores of CRM technology solution providers and picked out a list of prime choices. We have considered the vendor’s ability in providing solutions that can effectively, yet economically address the evolving needs of customers. We present to you Marketing Tech Outlook’ Top 10 CRM Solution Providers 2016. Intouch Solutions Offering CRM solutions for pharmaceutical and healthcare organizations to enable right message to right people and enhanced customer experience.